CATALINA ISLAND — The Catalina Eco Marathon, called “one of the nation’s most scenic marathons,” is scheduled to return Nov. 9. Runners will travel over 26 miles of single track trails and ridgelines, taking in majestic views of the Pacific from both sides of the island. Participants will run through three entirely different eco-systems and see the plant life and animal life in each. 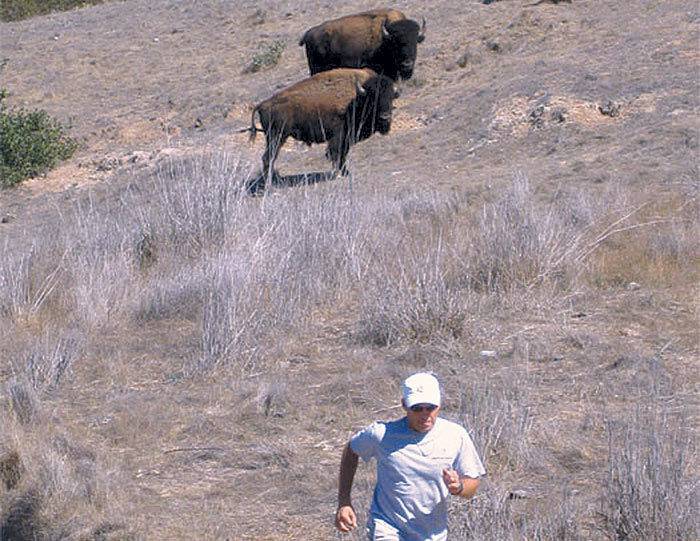 “Don’t be surprised to see buffalo on the course, seals in the water and bald eagles overhead,” event organizers said. Marathon runners will start and finish in Avalon. The entry fee for the marathon is $135 — and for the 10K, the entry fee is $40. The 10K run will begin at the fountain on Crescent Avenue, and the Marathon will start at the Sumner and Trenton Street intersection. With the marathon scheduled to start at 8 a.m. and the 10K to follow at 8:30 a.m., runners will have plenty of time to take the early Catalina Express boat out of Long Beach and make it to the start line for the beginning of the run. The Catalina Eco Marathon is a trail marathon that traverses the inner the roads and trails of the interior of Catalina Island. Participants are encouraged to bring their own water bottles, gels and other nutritional support for use between support stations. Support Stations will have water, Gatorade, candy, salt and other supplies. There will be 11 stations on the course, plus post-race food at the finish line. Water stations will be positioned approximately every 2 to 3 miles. All marathon finishers receive a medal and a training shirt; all 10K runners will receive a shirt, and the top three in each age group will receive a medal. Race day registration will take place on the Wrigley Stage next to the fountain, and in the middle of town. The start line is just steps away, so runners can quickly get registered and prepare for the race.